The Merriam-Webster Dictionary defines anarchism as “a political theory holding all forms of governmental authority to be unnecessary and undesirable and advocating a society based on voluntary cooperation and free association of individuals and groups.” In the early twentieth century, and again in the late 1960s and early 1970s, though little remembered today, advocates of anarchism played a role in the political life in Milwaukee. In the early twentieth century, anarchism found a following among recent Italian immigrants in Bay View. Within this community, some two dozen Italians attended meetings at an anarchist club above a saloon located at 300 Bishop Avenue (now 2496 South Wentworth Avenue). Milwaukee anarchists followed the teachings of Luigi Galleani, who believed in using revolutionary violence to bring about change. Generally ignored prior to World War I, Milwaukee’s Italian anarchists came under increased scrutiny after Reverend Augusto Giuliani of the Italian Evangelical Church in downtown Milwaukee held public “loyalty” events in Bay View in 1917 to support U.S. participation in World War I. During one of Giuliani’s convocations, gunshots were heard, and police shot and killed two people. Police also arrested and charged eleven Italians with conspiracy to murder Giuliani. Just prior to the Bay View shootings, the federal government initiated a series of nationwide raids against the local headquarters of the Industrial Workers of the World (IWW). In fact, federal agents raided three IWW offices in Milwaukee. The close proximity between the IWW searches and the Bay View incident led many commentators in Milwaukee to claim that the two events were connected. Following the arrests, anarchists planned retaliation. Shortly before the trial of the eleven Italians, a bomb was found next to Giuliani’s church. The bomb was later taken to the police station after officers failed to respond to calls from the church. At the police station, the twenty-pound bomb exploded, killing nine officers and a woman. Dozens of Italian American suspects found themselves in jail after the explosion, but no charges ever followed the arrests and the case remained unsolved. The next month, December 1917, the eleven defendants each received twenty-five year sentences. Soon after the trial, well-known radical Emma Goldman wrote an article titled “The Milwaukee Frame-Up,” which accused Giuliani of working with the Milwaukee Police Department to imprison anarchists. Goldman also appealed to her readers to raise money in support of the Milwaukee anarchists. Due in part to the efforts of Goldman, attorney Clarence Darrow appealed the case before the Wisconsin Supreme Court and won the anarchists’ release, though they were later deported. Two other bomb plots failed, including one in which two explosives left outside the home of prosecutor Winfred Zabel failed to explode. In the 1960s, anarchism experienced a resurgence nationally and in Milwaukee, as part of the youth counterculture and opposition to the Vietnam War. Milwaukee Yippies demonstrated against the war at the Water Tower Park and clashed with police over the right to be in the park. 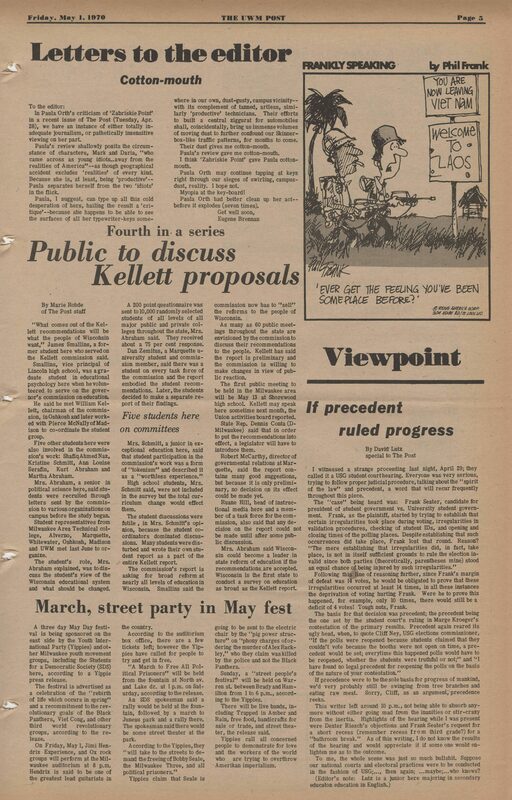 Underground newspapers, such as the Milwaukee Kaleidoscope (published from 1967 to 1971) revived commentary on anarchism, celebrated hippie culture, and advocated communal organizations for the betterment of society. Though these movements also faded in the 1970s after violent demonstrations and a severe crackdown by the police, the ferment of the time provided some of the energy that led to the founding of new institutions like the Outpost Natural Foods Cooperative. ^ “Anarchism,” Merriam-Webster Dictionary, accessed July 20, 2016; see also Dean A. Strang, Worse than the Devil: Anarchists, Clarence Darrow, and Justice in a Time of Terror (Madison, WI: University of Wisconsin Press, 2013), xiv. ^ Michael A. Gordon, “‘To Make a Clean Sweep’: Milwaukee Confronts an Anarchist Scare in 1917,” Wisconsin Magazine of History 93 (Winter 2009-2010): 18-19; Robert Tanzilo, The Milwaukee Police Station Bomb of 1917 (Charleston, SC: The History Press, 2010), 38; Strang, Worse than the Devil, 47-52. ^ Strang, Worse than the Devil, 64-65. ^ Gordon, “‘To Make a Clean Sweep,’” 22-24; Tanzilo, The Milwaukee Police Station Bomb of 1917, 71, 90-91; Strang, Worse than the Devil, 138-141. ^ For copies of the Milwaukee Kaleidoscope, see UW-Milwaukee Digital Collections, last accessed June 12, 2017. For background on the Yippies and 1960s-1970s youth culture, see “Memories Live When 1 Death Recalled,” The Milwaukee Journal, July 18, 1995, https://news.google.com/newspapers?id=PK4cAAAAIBAJ&sjid=Dy0EAAAAIBAJ&pg=6860%2C4447535, accessed July 20, 2016;” Man Killed by Police, Companion Shot as Store Is Fire Bombed,” Chicago Tribune, July 18, 1970, http://archives.chicagotribune.com/1970/07/18/page/16/article/man-killed-by-police-companion-shot-as-store-is-fire-bombed#text, accessed July 20, 2016. Tanzilo, Robert. The Milwaukee Police Station Bomb of 1917. Charleston, SC: The History Press, 2010.